It’s details like these that abound in the Bangor-based artist’s work. Where most see an old farmhouse, Krupke sees moments lost in time; a windowpane affords a peek to lonely vistas; a dusty staircase becomes busy with stories. They’re full of bright colors, with undertones of melancholy and solitude. She attributes her fervor for detail, to the greys between a story’s poles, to time spent with her grandfather, Edward Bailey. He displayed work in the first art exhibit at the then newly-opened Rockefeller Center in New York, said Krupke. She still lives among his work in her Bangor apartment today. It was advice that stuck. In 8th grade, a guidance counselor told Krupke to skip high school art classes unless she planned on being an artist full-time. Directionless, she took the advice only to realize later the void was too great to ignore. That year, she took private art lessons with Kal Elmore, a teacher at Bangor High School. “She nurtured me,” she said. “I needed her to be there to help guide me.” She’d go on to major in studio art and art history at UMaine on a full scholarship. Later still, she enjoyed residencies in Canada, Italy, and various points around her home base. Sometimes that means spending an hour walking through the Bangor City Forest “just to clear my head and get it ready for working,” she said. Some days are productive, while others are spent fighting whatever’s still rattling in the brain. Oftentimes, she said, listening to a book on tape or music helps, but you have to be careful—what you listen to translates into the painting. Sometimes, she’ll listen to the same song on repeat for the entire painting in order for it to maintain the same feel. She works predominantly in oils, because they’re easier to manipulate and less quick to dry. She doesn’t use solvents or toxic solutions. For fine detail work, she said, she uses oil-based colored pencils, a trick developed years ago when she was painting with her fingers and struggling to create detail. 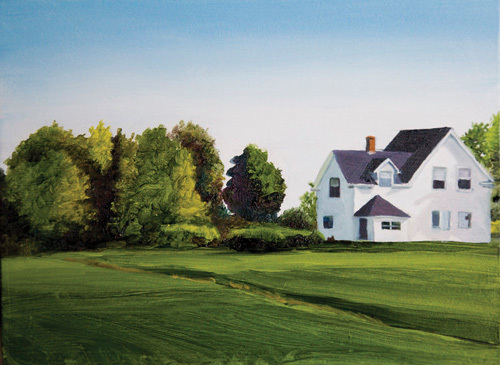 It imbues her work with a lifelike quality that’s ephemeral and idyllic. She said she has no intentions to stray far from her chosen subject matter. For more about Rebecca Krupke, visit rebeccakrupke.com.